Inland Northwest Culinary Academy student Jessica Sullivan (center) with her Loco Moco dish. The thin, crispy crust of breadcrumbs on top gave way with a gentle fork thrust to a creamy blend of Virginia sweet corn, cheddar cheese and green chiles underneath. The collard greens and black-eyed peas served alongside were cooked to perfection, and it was all prefaced by an amuse-bouche of bacon, biscuit and honey that was an ideal combination of salty and sweet. The first visit to any restaurant is a gamble, but between the attentive but unobtrusive service, the white-tablecloth décor and incredible price point — a mere $7.50 for my selection from the week's "Southern Hospitality" menu — it turns out Orlando's is a fairly safe bet. You might not assume that on first approach to the student-run restaurant located in the nondescript "Building 1" on the Spokane Community College campus. Tucked in a hallway across from the campus Public Safety office, the transition from fluorescent-lit industrial campus vibe to the dimly lit, borderline-chic dining room of Orlando's is abrupt. Once inside, though, it's easy to forget the buzzing college life happening outside. 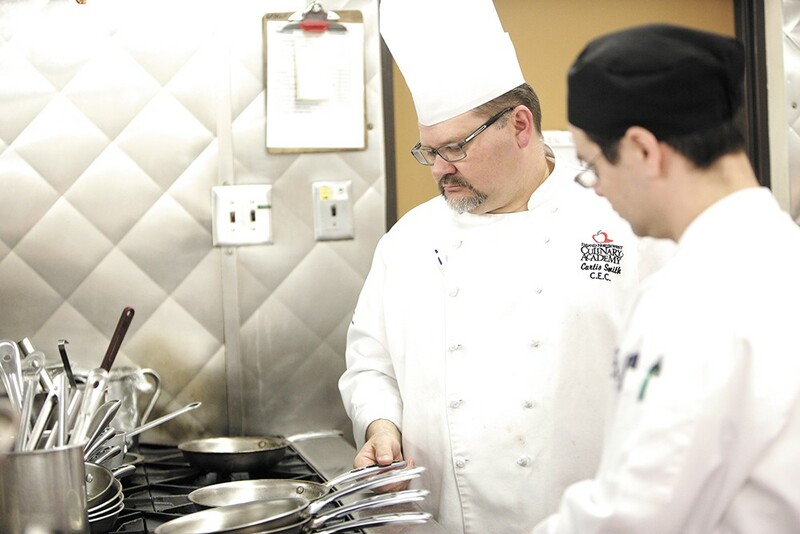 That's by design, according to Chef Curtis Smith, department chair of SCC's Inland Northwest Culinary Academy, or INCA, which has run Orlando's as a hands-on aspect of its students' experience for decades; Curtis was a student of the program in 1988 and '89, and met his wife there. 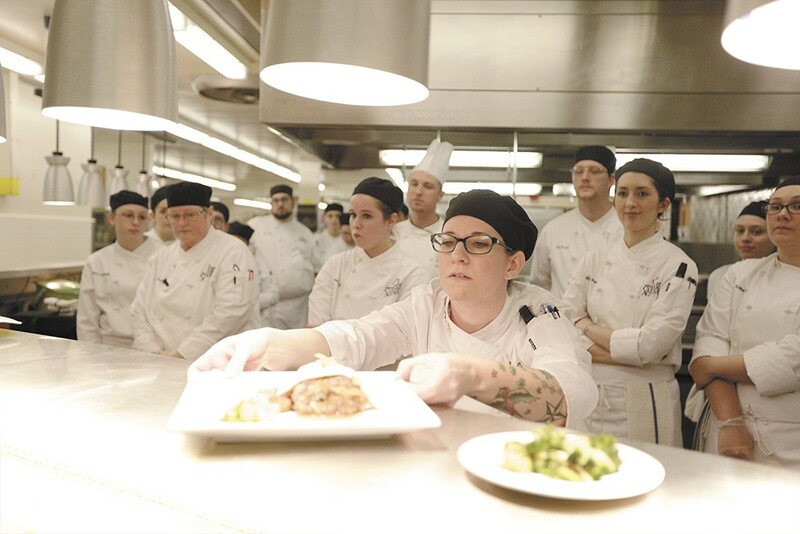 "Primarily, it's to provide students with an opportunity to cook in as close to an industry or real-life situation as possible," Smith says. "We're a cooking school first, and a business second, but we try to run that restaurant as close to how it would be run in industry as possible." INCA students spend six quarters in the program before graduation. Half of those involve working at Orlando's, doing everything from waiting tables to prep work to manning the grill as orders come in. And they come in fast; Orlando's is open for lunch Wednesdays through Fridays during fall, winter and spring quarters, and the restaurant does such a steady business that reservations are the only guarantee of getting a table. Curtis Smith, the INCA department chair, hopes to provide a real-life feel that mirrors the restaurant industry. Jason Rumley, a 29-year-old in his final quarter, is currently working at Orlando's, interacting with customers as a server and host. It's not his favorite part of his time at INCA — "I prefer the kitchen over the front of the house. I love to cook. I love to butcher meat." — but he appreciates that the program forces him to learn all aspects of a restaurant. That's something that will come in handy for his plans to be a chef or restaurant manager in the future. Rumley, who worked in food service for 11 years at Gonzaga University, discovered Orlando's and INCA by happenstance. He was an SCC criminal justice student and would pass the restaurant as he walked down the hallway to his classes. Eventually he decided to step inside and join the INCA program. It's been a challenge, he says, particularly the baking and pastry part of the curriculum — a retail espresso shop and bakery full of student-made wares is adjacent to Orlando's — but he's confident he'll be able to find a good job. His friends are already taking advantage of his new culinary skills. "Since I started in the program, my friends want me to come over for potlucks, for barbecues," Rumley says. "They want me to cook all the time." Alexis Coopersmith, a 20-year-old Spokane native, remembers her dad being in the INCA program when she was in sixth grade. She works at Ferrante's Marketplace Cafe on the South Hill doing "a little bit of everything," but has an entrepreneurial streak to go along with her cooking interests. "Eventually I want to open up my own restaurant, a breakfast place," Coopersmith says. "I love cooking breakfast food." For her, the toughest part of the program, and working at Orlando's, is learning all the different cuisines that can appear on the menus designed by Chef Smith and his fellow faculty members. One week at Orlando's might feature Asian cuisine; the next is French, or Mediterranean. The techniques the students learn in the classroom all apply to different stations in the kitchen, and they come into play no matter the style of cuisine.